People around the world have been touched by the viral photos of Rocky, a wounded military dog, sharing a hospital bed with his handler, Specialist Andrew Brown. Both were injured by an IED explosion in Afghanistan earlier this month. What’s especially moving about one of the photos, which was posted on the 89th Military Police Brigade’s Facebook page, is the Purple Heart on Rocky’s collar. 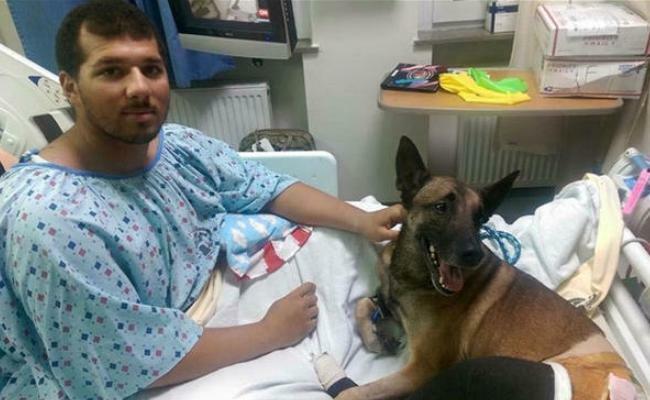 Did the military dog who suffered a broken leg and shrapnel wounds really receive this honor? The answer is no. It was only awarded to Brown. Ever since World War II, the U.S. military has only awarded the Purple Heart to two-legged heroes. Rocky and a handful of other military dogs have only received honorary or commemorative Purple Hearts. “The use of military decorations is limited to human personnel who distinguish themselves in service to the nation,” Defense Department spokeswoman Eileen Lainez said in 2010, according to the American Kennel Club (AKC). For the past 10 years, Ron Aiello, founder of the United States War Dog Association, has been urging the Department of Defense to establish an official medal for those military dogs who also distinguish themselves in service to the U.S. The last military dog to officially be honored with a Purple Heart was Chips, the most decorated dog of World War II. “For ‘singlehandedly’ wiping out a machine-gun nest in Italy, a dog named Chips was awarded the D.S.C., the Silver Star and the Purple Heart,” TIME reported in February 1944. All the press Chips was getting caught the attention of the commander of the Order of the Purple Heart, according to Military.com. The commander complained to President Roosevelt and the War Department that giving the Purple Heart to a dog demeaned all the men who had received one. Chips was allowed to keep his medals, but the Army’s adjutant general, Major General James A. Ulio, ruled that no other dogs would receive the Purple Heart, TIME reported. The most decorated dog in U.S. military history was Purple Heart recipient “Sergeant” Stubby, who saved hundreds of lives during World War I by sniffing out mustard gas and barking to alert the troops when he heard artillery fire. 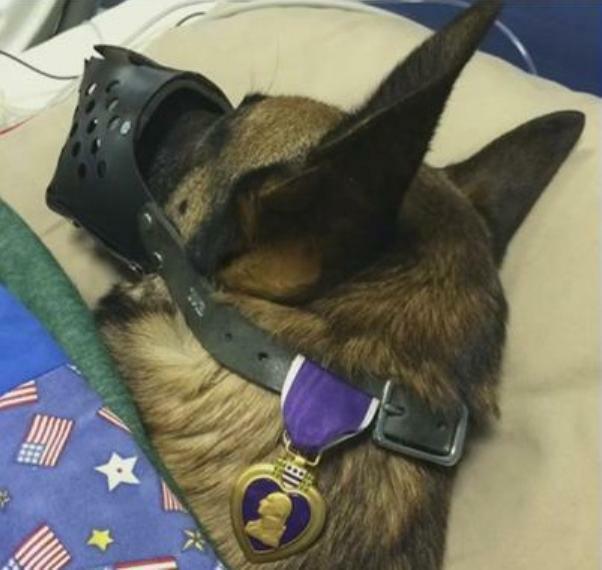 What’s especially unfair is that not only would this four-legged hero not receive a Purple Heart today, but he would not be allowed to live on any U.S. Army base. Why? Because Stubby would be considered a Pit Bull mix, one of several dog breeds banned from military bases today because they’re considered dangerous. The military dogs’ handlers will have first dibs on adopting their partners. As for Rocky, he is still recovering while Brown has returned home. “He is expected to make a full recovery, and depending on how fast he recovers, could be home soon,” the 89th Military Police Brigade reported on its Facebook page Dec. 15. The dogs bravely serve, they deserve the award. Or develop special awards for the dogs. Why? Because dogs are man's best friend! So loyal, so affectionate, and they're always by your side! That's great, bringing the working dogs back is an awesome recognition! It's worth to be honored however should consider how will honor rather than medal. Dogs want a home not medals.